It has been a while since I rode my Flamingo to and from work! Have not had the chance to ride it, due to many reasons. Finally, I found the chance to ride the Flamingo home today. Because of that, I now have the chance to take some photos that show the modifications that I made to the Flamingo. For this bike, because it is not meant for fast riding, the modifications that I made are not really related to weight or performance. Rather, it is to make the folding a bit better or for other practical reasons. As can be seen in the bike comparison I made earlier, one of the main differences between a Flamingo London NX7 and a Brompton is the cable routing. For the Flamingo, the cables are neatly routed internally through the main frame. 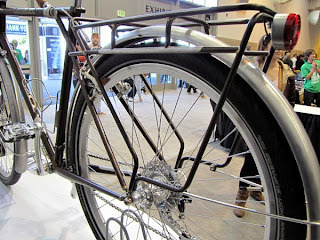 Although this looks neat, it is actually not good for the cables if the bike is folded and unfolded frequently. 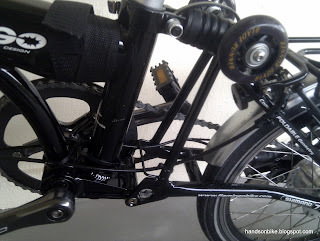 At the area where the cable enters the front of the frame, and exits the rear of the frame, the cable will tend to snag on the edges of the holes when folding or unfolding the bike. Also, the bending radius is quite small, which may deform the cable housing over time. This is the reason why I decided to tried out external cable routing on the Flamingo London NX7. 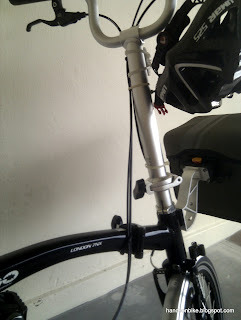 By referencing the Brompton bike, I re-routed all the cables a la Brompton, hoping to improve the cable routing. My Flamingo with external cable routing! 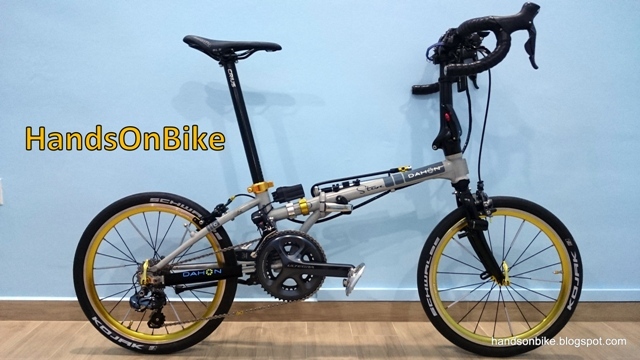 Looks a lot like a Brompton. The stock Flamingo with internal cable routing. Looks neater, but harder to fold as the cables tend to snag on the edges of the frame holes. Doing the external cable routing was not easy. 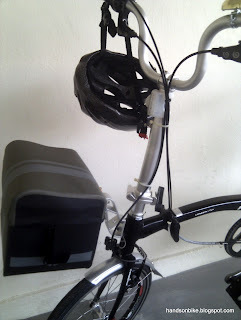 First, I had to learn the Brompton way of routing the cables, and also to find suitable places on the frame to hold the cables in place. The Brompton has many small loops on the frame to help guide the cables along the frame. For the Flamingo, I have to make do with cable ties placed at strategic locations. Another challenging part was to judge the length of the cable housings. For external cable routing, the cable length has to be quite precise. It must be long enough to enable smooth routing and unhindered steering, yet it must not be too long that it gets stuck or hooked when the bike is being folded or unfolded. Quite a bit of measurement plus trial & error is involved. The bike also needs to be repeatedly folded and unfolded during this process to try out the cable length and find ways to guide the cables. Re-routing the brake cables is still OK, because it is not too difficult to replace the brake cables and clamp the cable on the brake calipers. However, installing a new shifter cable for the Shimano Nexus 7 internal hub is new for me. Mounting the nut on the cable is not that easy, as the mounting length is quite specific, which again requires some trial & error. However, once set up, there is virtually no need to adjust it anymore. Re-routing the cables at the rear triangle. Note the new roller wheels! Cable routing at the handlebar area. Multiple cable ties required to ensure proper cable routing when folding and unfolding. Routing the cable around the handlepost and frame joint. After all that trouble, it is found that folding and unfolding the bike is a bit easier, as the cable does not need to slide into and out of the cable routing hole. Other than that, there is actually no big advantage by changing to external cable routing. I must admit that it is not worth the time and trouble to change the cable routing on the Flamingo London NX7. 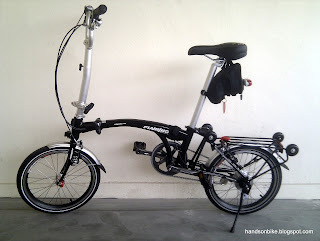 Still, it is interesting to try it out and learn more about the bike along the way. By now, you must surely have noticed the box mounted on the front of the bike! 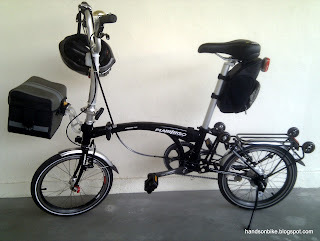 It is actually my Dahon Tour Bag, with the Dahon Luggage Truss. See more info about the Dahon Tour Bag here. The luggage mount does not fit onto the Flamingo luggage mount naturally, as the bracket dimensions are different. Some modifications was needed to make it work. I shall leave the story to another day! Just use the original bolt to fix the elastomer. If there are any problems you can always use another M6 bolt to fix it. Nothing special about the bolt.